Last week I was sent two boxes of wine samples from TastingRoom.com, a unique online retailer that enables consumers to discover and consume wine in several formats. The company is currently promoting a new series of celebrity chef wine samplers, curated by Chef Emeril Lagasse. The two collections, Emeril’s Holiday Party Sampler and Emeril’s Everyday Sampler, include Emeril’s favorite wines from around the country, his suggested wine and food pairings for every meal, and customized tasting notes. You can buy the Holiday Sampler HERE and the Everyday Sampler HERE. We brought the Everyday Sampler with us on our recent trip to Ixtapa, and enjoyed tasting the wines on our private patio outside our hotel room. This past weekend, we brought the Holiday Sampler with us to Incline Village and played a little game of “guess the varietal”. The bottles are really the perfect size for tasting (even shared by two people), and serve just the right amount to sense the wines properly (tannins, bouquet, color). 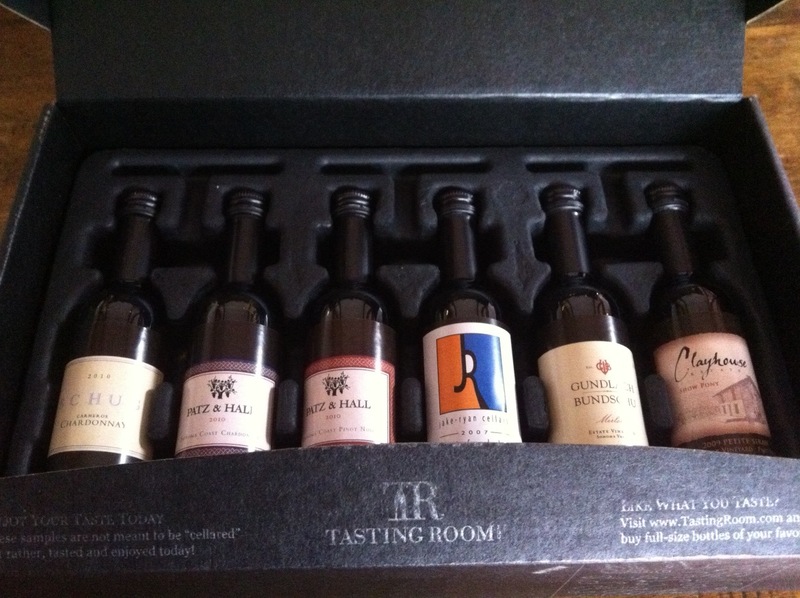 TastingRoom.com‘s innovative wine samplers are curated collections of six premium wines from around the world packaged in small 50ml (1.7 oz.) bottles. Their wines by the glass allow consumers to enjoy a single 100ml (3.4 oz.) glass of wine (singles or 4-packs) similar to a restaurant experience but without leaving home. TastingRoom.com‘s wine club allows members to make their own selections for each shipment, which includes a sampler and two bottles of the recipient’s choice. Whether it’s by the taste, by the glass or by the bottle, TastingRoom.com lets consumers enjoy wine the way they want it. TastingRoom Inc. uses its patented TASTE Technology™ to transfer wine directly from regular-sized wine bottles (750ml and up) into smaller formats. A focus on wine quality drives every step of the transfer and testing process so that wineries and consumers alike can rest assured that the samples are a true representation of the original. TastingRoom.com customers can be confident they will enjoy every bottle they buy because they are able to sample the wine prior to making a purchase. The new collection of samplers can be purchased online at www.TastingRoom.com. Take 25% off your holiday order with promo code HOLIDAY25 at checkout. You can find TastingRoom.com on Facebook here or follow them on twitter here. This entry was posted on December 3, 2012 by cavegrrl. It was filed under Uncategorized and was tagged with gift ideas, holidays, wine, wine tasting.